The group opposing Ports of Auckland’s extensions to Bledisloe Wharf is expecting more than 100 boats on the harbour at a maritime protest on Sunday March 22 at 3.30pm. The protest will take place on 22 March. The fleet will support a similar land-based demonstration on Queens Wharf as part of a campaign by the Stop Stealing Our Harbour group to get the port company to stop work on the extensions. The on-the-water protest has the support of major boating organisations including the Auckland Yachting & Boating Association, 96 per cent of the surveyed members of the Royal New Zealand Yacht Squadron and other boating groups and identities. The two-finger extensions to Bledisloe Wharf will project 100m in to the Waitemata Harbour and construction is due to begin next month (April). Stop Stealing Our Harbour says the extensions will completely block the view from Queens Wharf to the outer harbour, one of the most significant views on the Auckland waterfront and one that ratepayers have just spent $40 million on. It says no further expansion of the port should happen until Auckland Mayor Len Brown honours his promise to fully scrutinise the port’s plans. 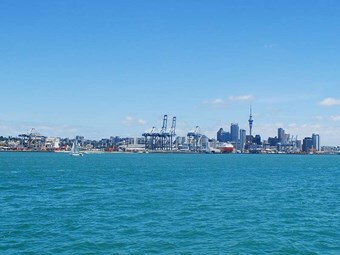 Spokesperson Michael Goldwater says in August 2013 the mayor announced an intention to commission a study – commonly referred to as ‘stage 2’ – to look at the long-term future of the Auckland port. "We are still awaiting that study." This week the group has taken out a full page advertisement in the NZ Herald newspaper containing an open letter to the port company urging it halt all expansion work. The letter has been signed by leading community, business, sporting and local body identities including Sir Stephen Tindall, Sir Peter Blake’s widow Pippa and his brother Tony. What: Maritime and land protest against Bledisloe Wharf extensions by Ports of Auckland. When: 3.30pm, Sunday March 22. Where: On the water muster opposite Bledisloe Wharf and then proceed past Queens Wharf – listen on Channel 27 VHS. On Queens Wharf, the public gathering will start at 3.30pm. Who: Opponents to ports land grab including Auckland boating groups.